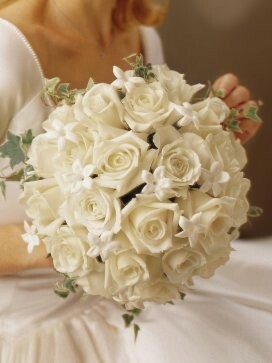 Graceful Rose and Stephanotis Scented Bridal Bouquet. This luxurious and lavish bridal bouquet is celebration of first class, fine large headed white roses perfectly complimented by sweet scented, dainty stephanotis flowers. This timeless classic bridal bouquet is indeed one that comes with endless elegance and sheer sophistication. 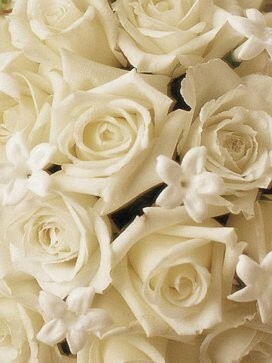 This stunning selection of white roses and stephanotis flowers is simple yet so very effective. 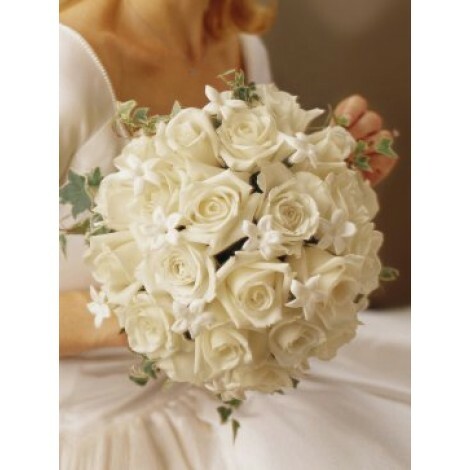 This white purity, hand-held bridal bouquet features; 12 white Akito large-headed roses 12 stephanotis blooms and 8 white large-headed roses with variegated ivy in a large bouquet holder.